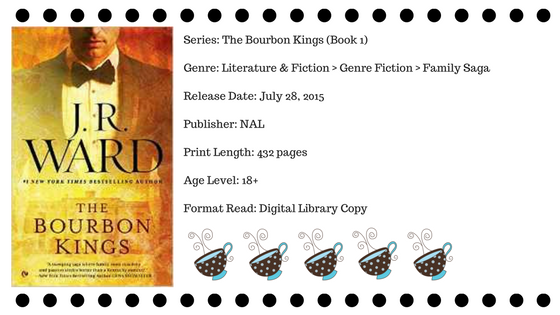 "For generations, the Bradford family has worn the mantle of kings of the bourbon capital of the world. Their sustained wealth has afforded them prestige and privilege—as well as a hard-won division of class on their sprawling estate, Easterly. Upstairs, a dynasty that by all appearances plays by the rules of good fortune and good taste. Downstairs, the staff who work tirelessly to maintain the impeccable Bradford facade. And never the twain shall meet. As family tensions—professional and intimately private—ignite, Easterly and all its inhabitants are thrown into the grips of an irrevocable transformation, and only the cunning will survive." I want to start off by saying that I've never read any of J.R. Ward's other books. The covers have always drawn my attention but I have never actually picked one up to read. This being said, I happened to pick this one up & take the time to read the synopsis. It sounded like something I'd really enjoy. Flash forward to one day when I was trying to fill the void after finishing up one of my prior reads. I decided to take a look around on an app that my local library is a part of: Overdrive (Informative post coming soon). I found this book listed on the app & decided to 'check it out'. And Oh My Gosh! This book ended up being WAY more than I had expected. Don't worry- it's not a bad thing. Let me explain: I was, more or less, expecting a book full of very little other than romance between Lizzie & Tulane. What I got though... an assorted array of scandal & 'soap opera' like shenanigans. There were characters I loved & others that I hated. Questions were raised & I just did not want to put the book down.